Cervus Canadensis or Elk, as it is popularly known, is a native animal of North America and Eastern Asia. Not only is it one of the largest species of deer in the world, but is also one of the largest mammals in North America and eastern Asia. Attractive they are, and maybe that’s the reason why they have been for long, and still, are hunted as a game species in various different parts. Their meat is leaner and higher in proteins, plus their antlers and ivories are often collected as game trophies. Despite this fact, they continue to flourish in their respective habitats. Off late, because of ease of availability of their food sources and adaptability to survive in varying climate, they have been introduced in Argentina, Australia, and New Zealand and are growing well. To know more about these elegantly slender creatures, go through the next section. Elks inhabit the mountain meadow and forests of different parts of North America and Asia and being herbivores, feed on grass, bushes, and saplings. Elk is a ruminant animal: even-toed, cud-chewing, hoofed and horned mammal and has a stomach which is divided into four compartments. This four-chambered stomach allows for digestion of the food they eat. Possessing a compact body with long and powerful legs, elks are great runners and swimmers. They are also among the largest form the deer family. However, they are not as big as moose. The Roosevelt elk is the largest subspecies of Elk and the largest males of Alaska Roosevelt elk can weigh around 600kg. The male elks are called bull and the females are called cow; their newborn is known as a calf. The collective name for a group of elk is called a herd or gang. Only the male elks grow antlers and that too, they shed and grow every year. They shed them at the onset of winters and grow them back in springs, right before the mating season. The new antlers are covered in a skin called velvet. The antlers grow an inch in a day and the growth is achieved by the flow of blood in them. The antlers of a mature bull can weigh around 40 pounds. The more the antlers are spread, the more attractive an elk bull is for the cows. The males use their antlers to fight with other potential males to attract the attention of the females. ‘Fatal attraction’ is the term given to the technique in which the male elk bath in its own urine. It does it in an interesting way by digging up holes in the ground, filling them with urine and rolling over it to attract cows. After a gestation period of 240 to 262 days, the cow gives birth to one offspring (twins are rare). Known as calf, the newborn weighs around 15 and 16 kilograms and is able to stand just after 20 minutes of its birth. Born spotted and scentless, the calves lose their spots by the end of summers. Calves spend the first few weeks in hiding with their mothers. The mother too protects the newborn by hiding it in a log or shrub or among tall grasses for the first few weeks. The females isolate themselves from the herd and remain away until the calf is large enough to escape the predators. Both, the mother and the calf are a prey to wolves, coyotes, cougars, mountain lions and bears. The calves join the herd at two weeks of age and are fully weaned when they are 2 months of age. They remain with their mothers for almost a year, leaving at the time when the next off springs are born. The elks raise their heads high, open their eyes wide and move stiffly and rotate their ears when they are alarmed. Curling back their upper lip, grinding their teeth and hissing softly is how elks communicate with each other, when they sense danger. The bull gathers the cows and calves into small groups which are called harems and they protect the harems till death. 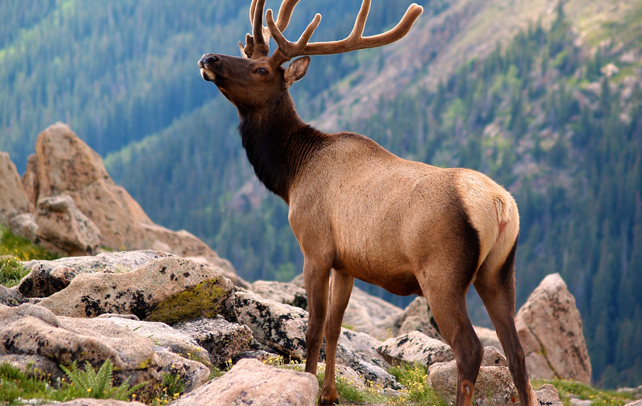 The unique sound made by an elk is known as a bark or a bugle. The elk can live 8 to 12 years in the wild and up to 20 years in captivity. During summers, the elk eats continuously, consuming anywhere between 4 and 7 kg daily. Elks have different coloured coat in different seasons and habitats: gray or lighter coloration in the winters and a darker coat and reddish coat in the summers. An elk’s top two canine teeth are called ivories. The elk beds down in the trees at night during winters and in shady forests during the day in summers. Elks are hardy livestock; they are naturally immune to most diseases and can contract normal bovine diseases. The antlers and velvet of elks are often used as common ingredient in traditional medicines in parts of Asia. The Elk been listed by International Union for Conservation of Nature as ‘Least Concern’.